Adventures in Public School and Hochelaga are the year's best Canadian films. It’s been a quietly respectable year for Canadian film. I realise that statement might not read like a compliment, but I’m still caught off guard by how hard it was to see Canadian movies this year. In the seven years that I’ve been writing this blog and covering the Canadian film beat, or at least trying my best to do so, 2017 posed the biggest struggle for finding Canadian content. It just wasn’t out there as much as it’s been in previous years, or, if it was, it was far less visible. I can’t really pinpoint the major factors. Too few major directors? Maybe. But with Denis Villeneuve doing Blade Runner, Jean-Marc Vallée doing Big Little Lies, and Sarah Polley/Mary Harron doing Alias Grace, this year could have crowned the next Canadian auteur. I’m sure more than one of the directors on the list below is destined for greatness, and some have already arrived, but I think we collectively slept on giving them the boosts they needed while we focused our attention on unnecessary sequels for Goon and Bon Cop, Bad Cop, which weren’t even worth writing about let alone seeing. We also had Maudie, which boasted a performance by Sally Hawkins that could have landed her at the Oscars if she wasn’t destined for the podium for The Shape of Water. And I must admit that I admired Maudie’s legs every time I stepped out of my apartment and saw her name on the marquee of the Mt. Pleasant theatre where it ran for 30 consecutive weeks. It’s one film one on screen in one city, but if a movie has word of mouth strong enough to carry it for that long of a run, we must be doing something right. Maybe let’s go back to the “quietly respectable thing.” The majority of the films here are very small personal films, but their independence and autonomy makes them strong. In some way, the best Canadian films of 2017 gave us one great character to which we could relate, identify, and spend two hours immersed in the experiences of others. 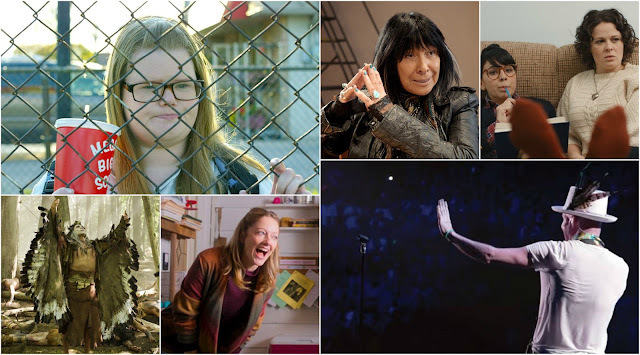 Maybe that great character was a plus-sized high schooler, the poet of Canadian rock, a young Afghan girl, or a site of history, but the best Canadian films this year used singular experiences to tell stories that zoomed back to teach us more about ourselves and find universal resonance within a unique tale. Bobbi Jo Hart does a grand jeté with the wonderfully inclusive dance documentary Rebels on Pointe. The film goes backstage to profile Les Ballets Trockadero de Monte Carlo, the successful New York based company that knocks the stuffy art of ballet off its pedestal with its all-male, all-gay, and all-drag ballet. Hart presents the usual sequences of choreography, practice, physiotherapy, and make-up application, but Rebels on Pointe gives them a distinctive spin as the dancers have a laissez-faire attitude that one doesn’t often see behind the scenes. Plus, it features the best un-ironic use of Jann Arden’s “Good Mother” you’ll ever hear. This invaluable film offers an incredibly brave risk in Attiya Khan’s idea to revisit her abusive ex-boyfriend about the farm he inflicted years ego. Equally brave is the choice of said ex-boyfriend Steve to sit down with Khan and confront the sins of his past. A Better Man shows the possibility of finding closure and resolution through dialogue as the conversations and therapy sessions Khan and Steve share offer a healing process for them both. This film needs to be in classrooms, workplaces, university campuses, and screens everywhere for its positive and productive conversation on gender-based violence. It’s difficult, but necessary viewing. Screenwriter Anita Doron introduces a brilliant stroke to her adaptation of Deborah Ellis’s novel by adding the fable of the Elephant King within the larger story of a young girl named Parvani who finds strength and independence in Taliban-controlled Afghanistan. These scenes contrast classical compositions with paper cut-outs that draw upon the folklore and mythology that inspires Parvani’s quest. The Breadwinner gradually introduces the story of the Elephant King as Parvani cautiously goes out into public dressed as a boy and the film intercuts them more frequently and quickly as the tale inspires her to defy convention and reach heroic heights. The Breadwinner is a visually striking fable with a grand international scope that tackles complex subjects of family, identity, and belonging. Not one but two great music docs define the year in Canadian film! These entries into the most popular sub-genre of non-fiction are long overdue in Canadian film, since, we don’t have nearly enough definitive music docs to honour the artists who add some CanCon to the airwaves. This immaculately assembled film uses the talking heads approach to inject a flavour of oral storytelling into the unsung history of Indigenous musicians in the annals of rock and roll. Canada finds its 20 Feet from Stardom in this energetic music doc as Rumble features an admirable cast that ranges from Buffy Sainte-Marie to Martin Scorsese to pay tribute to the unheralded legacy of Indigenous musicians. Judy Greer finally receives the great performance we all knew she had in her, but never had the chance to give. She plays an utterly endearing helicopter parent named Claire in Kyle Rideout’s upbeat and funny Adventures in Public School (né Public Schooled) about a mother who lets her son, Liam (Daniel Doheny), out into the wild after 16 years of home schooling. Greer’s performance should help this little comedy find an audience both here and in the States, and it’s refreshing to see Adventures in Public School hit a similarly sweet note as Don’t Talk to Irene and deliver an offbeat voice like Dim the Fluorescents to prove that Canadian films can do comedy really, really well. It’s laugh-out-loud funny and sweetly irresistible. Dim the Fluorescents might be the Canadian hidden gem of the year. (Okay, one of many.) The film features two powerhouse performances by Claire Armstrong and Naomi Skwarna as best friends/roommates/co-workers/aspiring actresses Audrey and Claire. The pair has the peculiar business of staging brief but important demonstrations for companies and human resources departments about subjects like conflict resolution and combatting sexual harassment in the workplace. (Timely!) They deliver these sketches with the utmost seriousness, played in pitch-perfect deadpan by Armstrong and Skwarna, and thrive as professionals. This authentic film rings true in the friends’ struggle to break through Toronto’s competitively rigged arts scene, and Dim the Fluorescents finds in these starving artists the plights of creatively minded millennials in Canada. The final scene in which the friends confront their insecurities on a stage for all to see is easily the single most brilliant feat of acting in any Canadian film this year. What a bittersweet film to celebrate this year. The passing of Gord Downie just a month after Long Time Running premiered revived the collective Canadian pride and gratitude for the poet of Canadian rock. This doc ends with an equally poignant tribute to Downie and the Tragically Hip as it cuts together images of Canadians from coast to coast, singing in unison and joining in song. The film masterfully evokes the Hip’s legacy of giving a voice to Canadians when their airwaves remain oversaturated with American music. Downie ends each concert by enthusiastically thanking music lovers, but Long Time Running, which deserves to be seen on the biggest screen with the volume set to the highest possible decibel, is just one way to thank the biggest music lover this country ever saw. X marks the spot for an epicenter of Canadian history as Hochelaga explores the many lives that have crossed this corner of Montreal throughout the ages. Hochelaga spans from the pre-contact years to present day, and the expansive scope of the film puts Canada’s settler history under the microscope. The souls of the Iroquois haunt the land with a breathtaking narrative that Girard intercuts throughout the film and shows Hochelaga with the original inhabitants of the territory. This film is shot so beautifully and the production values are simply outstanding, so I really hope that Hochelaga finds an audience for its important and haunting tale. Girard laudably balances a highwire act of onscreen representation deliver a sweeping historical epic that is politically correct, rich in its period details and research, and sensitive to the diverse multicultural audience of contemporary Canada. It’s a fine film to encapsulate all the pride and shame entailed within Canada 150. I don’t think any movie made me smile as much as Don’t Talk to Irene did this year. The sophomore comedy from Pat Mills is an infectiously feel good coming of age tale as misfit Irene (Michelle Macleod) quietly rebels against her mother and convention by rallying residents of the local retirement home to be her dance team / posse. Macleod gives a fantastic performance full of spunky energy—and she really shines in a year that featured several outstanding breakthrough roles on the Canadian film scene. She anchors the film as a loveable outsider who relates to all the anxieties and insecurities one faced during the horribly awkward high school years. Featuring a marvellously self-deprecating cameo by Geena Davis, a buoyant poppy soundtrack, and a swan song of a performance from late actor Bruce Gray, Don’t Talk to Irene is fun, positive, upbeat, and inclusive—it’s the one film on this list I’d unreservedly recommend to anyone. Cheers to Pat Mills for providing a ray of sunshine this year desperately needed. What are your favourite Canadian films of the year?